Ever profile a CD? We used to profile CDs more often when the technology was new. 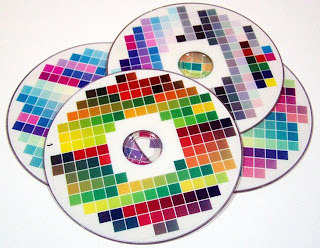 Since then it has become fairly easy to profile the sheets of adhesive label materials which are then applied to the CDs. We can profile that too! This illustration is a set of CD targets we developed for use in profiling printers like this.